Continental Spain is divided into 13 regions (large type in the map above) whose boundaries are roughly those of its ancient kingdoms and ethnic regions. 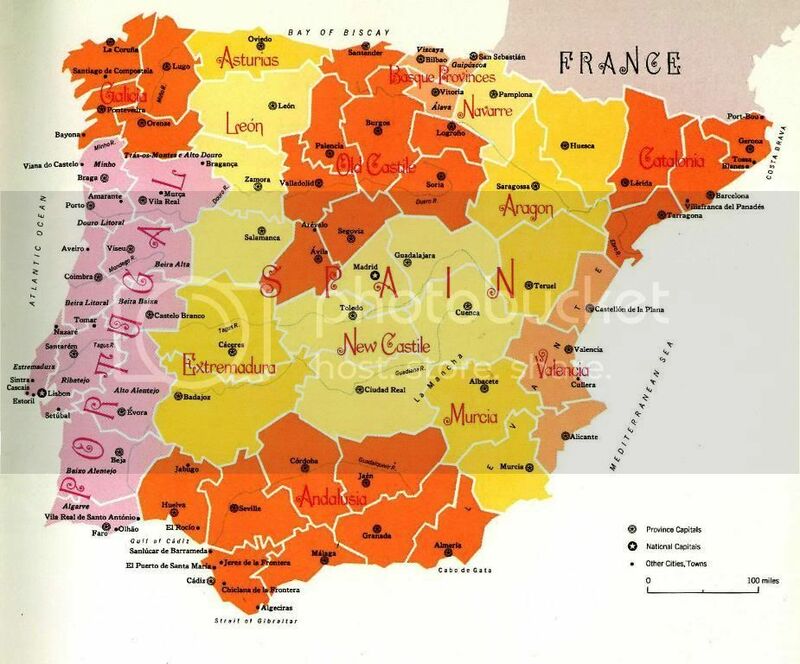 Many of these regions - such as the Castiles, Aragon and Navarre, retain their ancient names. The regions are divided into 47 provinces, most of them bearing the same names of their capitals (small type on the map). The exceptions are Navarre, whose capital is Pamplona, and the three Basque provinces - Álava, Guipúzcoa and Vizcaya. Portugal is divided regionally by geography into the mountainous, sometimes humid north and the more gentle, drier south. These two regions are organized into 11 provinces (small italics on the map). Spain enjoys a vastly diffuse and dramatic gastronomic heritage. Traditional Spanish cooking draws on European impressions from the north, Moorish influences from the south and, thanks to early explorers ingredients from the Americas and the Far East. Spanish food is existing and diverse. Contrary to most North Americans beliefs it is also mild and deeply flavoured. Moors bought pomegranates and pesto and North African Jews cooking with nuts. Potatoes and tomatoes were brought first by navigators sailing to the Americas and returning with plants, gold, and new ideas. Coriander came to the Canary Islands via traders. The fact that Spain has spent so much of her history overrun by outsiders intent on possession might first appear a disadvantage from a culinary point of view. 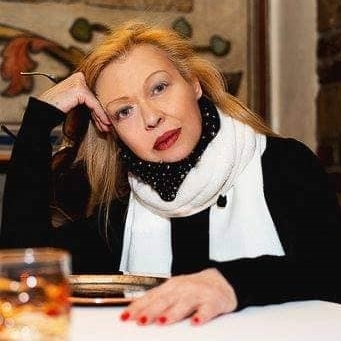 The result, however, has been that Spanish cooking has absorbed a range of quite wonderful and different cooking styles, "cocinas", and made them her own. Some are simple, others more complex, but in all the quality and freshness of ingredients are paramount. Even today homemakers shop daily sometimes twice a day to secure the freshest vegetables and/or fruits. Spain by European standards is a relatively large and geographically diverse country. Cocinas (cookery or cuisines) in Spain can be divided into a number of gastronomic regions. These divisions have come about because of the evolution of local traditions, each enriched in various ways in antiquity by Greeks, Carthaginians, Romans and Moors. A good part of the country is along the Mediterranean Sea, the north along the Atlantic Ocean the middle on a high plateau. Some parts are dry throughout the year in others rain falls frequently and on others sunshine tends to be abundant. Catalonia just west of Languedoc along the Mediterranean Sea has a different cuisine than other parts. They are Catalans with a different language and culture. The food has French overtones. Further west along the coast, the Levante distinguishes itself by rice dishes like paella and others. Andalusians like to fry everything and love cold soups (Gazpacho) due to the hot weather. In Central Spain, people prefer roast meats to other types of preparations. Around Rioja, just west of the Pyrenees cooks have been known to stew everything that can be stewed and excel with their specialties. The north along the Atlantic Ocean stands out with its specialties that require sauces and fish dishes. Spanish consume inordinate amount of fish and have been coming to Newfoundland for centuries to load up on cod and other valuable species. Saffron, mild and sweet or hot and spicy pimenton, olive oil, Sherry vinegar, rice, pulses, bay, thyme, rosemary, fresh fruits and vegetables, piquillo peppers, garlic, capers, pickles, hams, cured meats, canned tuna, salted anchovies, cheeses, meats, fish and poultry. Galicia along the Atlantic coast is never without the maritime influence of the ocean. Specialties include octopus with potatoes and onion, or stewed in olive oil and paprika. Shellfish is grilled a la plancha. Pork, veal, lamb, partridge, quail and wild boar are also used in stews, roasts. Everywhere in Galicia one finds empanadas, a dough-based Gallego dish may arrive in many forms, usually stuffed with sofrito – chopped onion fried in oil, with a little tomato. And they are thoroughly enjoyable before the main dish is served. Many different local cow's milk cheese exist, with San Simon famously smoked over birch bark shavings, whilst Tarta de Santiago, a confection of eggs,almonds, sugar and breadcrumbs dusted with icing sugar, carries an imprint of the cross of Santiago, St James. Many consider the Basque country, Navarra and Rioja, located just west of the Pyrenees, the gastronomic centre of Spain. Basques call tapas pinchos. Here fish is a staple for these seafarers and marmitako, names after the marmita or stew pot and featuring tuna with potatoes, green peppers, tomatoes, onions and garlic is a specialty. Dried cod, bacalao, is widely used, either al pil-pil, cooked in an emulsion of oil and garlic, or a la Vizcaina, with dried peppers and onions. Piperada is red pepper, onion, tomato garlic and fresh herbs served with a generous slice of ham. Other fish dishes prepared in the traditional earthenware cazuelas, such as merluza la Vasca (hake) and angulas (eels cooked in olive oil, garlic and red chilli) are an excellent choice. Once a week the Ordicia market one of the most popular of the entire region offers an array of local specialties; Idiazabal cheeses, dried beans, fresh vegetables, breads made with wheat or corn flour. In Navarra, the menestra de verdura reigns supreme (artichokes, chards, borage). While in Rioja, a region well known for its excellent red wines, fine dry white wines, and superb sweet wines, dishes with chorizo and red peppers are favourites. Bound by the Pyrenees to the north, the Ebro delta to the south, the kingdom of Aragon to the west and the Mediterranean Sea to the east, Catalonia has long been Spain's most international region. Location and geology provide a range of ingredients: palm hearts and fig trees in Tarragona, prickly pears and bilberries in Gerona, rice and wild duck along the Ebro River, partridge and woodland mushrooms from the Pyrenees, often prepared as revuelto, scrambled as if they were eggs. Catalonia has a love of snails cooked in many different ways and an array of sophisticated dishes that include fruit, nuts, and even chocolate. This region is also renowned for its charcuterie. This is the land of roasted vegetables, escalivadas and salads prepared with salted cod, with fresh tomatoes, onion and olives dressed with vinaigrette. Tomatoes and olive oil are the secrets of the Great Catalan treat Pa amb Tomaquet: bread, ripe tomatoes and the best olive oils from the areas of Borges Blanques and Siurana. Catalan classic cocido, is a substantial dish cooked on the hob in one pot with pork, especially salted, veal, haricot beans or chickpeas, carrots and leeks among other vegetables. These well cooked ingredients are taken from the stock, which ahs Spanish pasta, or rice added to make a nourishing soup, vegetables are dressed with olive oil and the meta is served with tomato sauce creating three dishes from one. In Tarragona the romesco de peix, a fish stew, uses floured fish briefly seared in hot oil, sofrito of tomato and onion and a picada maede with pounded almonds, peppers, pine nuts, hazelnuts, garlic, saffron, toasted bread, parsley and olive oil. Another sauce frequently present on the table as a condiment is al-I-oli, perhaps better known as aioli. Traditionally consisting of pounded garlic and olive oil it now frequently includes egg yolks. In Barcelona the Boqueria Market is renowned for the quality of the fish section. Local Catalan cheeses include tupi, fermented with eau-de-vie in the Pyrenees, Lerida's formtage Serrat, and an ewe's milk soft cheese Mato often enjoyed with honey. Here are some Catalan specialties: Habas fritas (fried braod beans), Judias verdes con jamon (green beans with ham), Samfaina (Catalan braised vegetable sauce), Zarzuela de maricos (shellfish in seafood sauce), Pato con higos (duck with figs) and Polvorones (almond shortbread). Valencia's rice dishes are world's best. Paella is a dish and often misnamed cooking utensil. The pan used to cook paella is actually a paellera. The paella is prepared with chicken, rabbit, tomatoes, beans, saffron and paprika, while other rice specialties such as a la marinera, include fish and shellfish. Fideaua is another local specialty cooked with pasta instead of rice in the paellera. This is a land of sweet oranges and mandarins. Much the production is exported to other European countries. Some of the citrus is shipped to North America. In the Balearic food tradition, we notice a particularly Mediterranean cooking technique using sweet flavours in meat and fish recipes. For example raisins are used in stews, and nuts added to many recipes. Specialties here are sweet and savoury pastries a holdover from Arabic era. Madrid has only been Spain's capital since the Hapsburg dynasty. Philip II (XVI the century) decided to settle his court in the Peninsula in the middle of the high plain, the meseta, for strategic and security reasons. North of Madrid is justly famous for roast marts, especially roasted baby lamb or suckling pig. To the south in the area of La Mancha are cheeses, with manchego being Spain's most famous. South of Madrid in Toledo, famous specialties are; partridge cooked in a cazuela and delicious marzipan. Madrid itself is famous for its cocida Madrileno (another version of one pot stews) consisting of chickpeas, vegetables and meat in broth. The origins of cocido can be traced back to Celts and are found all over Spain in many versions. The Madrilenos enjoy porras and churros. While both are enjoyed for breakfast, churros and chocolate are the classic merienda, or tea. These fritters, which are made from a light batter, are piped into hot oil, deep fired and dusted with sugar. Chocolate, brought to Spain from Mexico in the early 16th century, started life as a bitter drink consumed by the Aztecs. However, at the convents of Oaxaca, Spanish nuns used the basic ingredient, cocoa and transformed it into a sweet preparation which at the time, was a state secret eventually sold to the French by Philip IV in 1728. Other Madrid specialties are bartolllos and canutillos, fried pastries with confectioner's custard. Pastry for triangular bartollos is a mix of olive oil, a little lard, eggs, flour and sugar whilst canutillos use flour, olive oil, salt, milk and a few drops of vinegar to produce a very different texture. The legacy of Phoenicians, Carthaginians and, to an extent, Jews, is evident in the food of Andalusia but overshadowing everything is the heritage of the Moors, of majados or pound ingredients, fried food and bittersweet flavours. Phoenicians left behind saffron, one of Spain's signature spices; Carthaginians brought the chickpea from north Africa, Romans installed irrigation systems, encouraged fishing and cultivated olive trees, but during their 700 year rule the Moors contributed a multitude of ingredients – figs, pomegranates, spinach, aubergine (eggplant), rice, and almonds. They developed a culinary repertoire using preparation techniques and spices unknown in the rest of Europe. Andalusia is the largest olive oil producing region in the world. Possibly the most outstanding Andalusia dish that can be traced directly to the Moors is gazpacho, one of the world's best known cold soups. Tomato, bread, garlic, olive oil, vinegar and water, with cucumber and peppers as options, were traditionally pounded to produce a sooth paste, the responsibility of the casera, the woman cooking for the teams of labourers. Five of Analusia's eight provinces are on the Mediterranean coast where grouper, sea bass, red mullet or gilt-head bream are often cooked in salt; hake steaks or small whole hake, sole fillets and anchovies are fried in olive oil. Squid rings are breaded and fried in olive oil to be served as tapas and washed down with dry sherry wines. Inland dishes are pork based , for cork and walnut groves are a favourite hunt of the black Iberian pig and today cured hams, chorizos and black pudding from Garanada and Huelva command high prices. Pastries are based on Moorish and Jewish traditions, still produced in many convents, is highly prized, as are yemas, delicacies consisting of egg yolks, sugar milk and spices. From a gastronomic perspective, the Canary Islands set in the Atlantic Ocean are closer to Africa than to Spain and are world of their own. Bananas and papayas grow abundantly and show up in a wealth of dishes. The Canaries are famous for their excellent potatoes, dipping sauces, watercress soup and rabbit in sauce of garlic, red pepper, cumin, pimenton, salt and pepper. Back on the mainland it would be impossible to complete the list of Spanish regional cuisines without mentioning Extremadura bordering Portugal to the west. A beautiful land of holm oak trees, chestnut trees and cherry this is where the black Iberian pig tastes best. The skilled ham curers of Extremadura produce several well known pork specialties including ham (jamon Serrano). This is also the land olive oil, pimenton and the outstanding cheese called Torta del Casat, made from the milk of Merino sheep, better known for its wool. Article contributed by Hrayr Berberoglu, a Professor Emeritus of Hospitality and Tourism Management specializing in Food and Beverage. Definitely a sheer pleasure read .. After being here for 21 years come this January, the research is quite excellent .. Of course, we could write a book on this topic or a series of books on each región ! Thanks for posting this ..
All my best for a lovely day ..
Wild Hunted Boar Charcuterie ..
From: Vizcaya - The Basque Country ..
As one can see the meat is lean and white ..